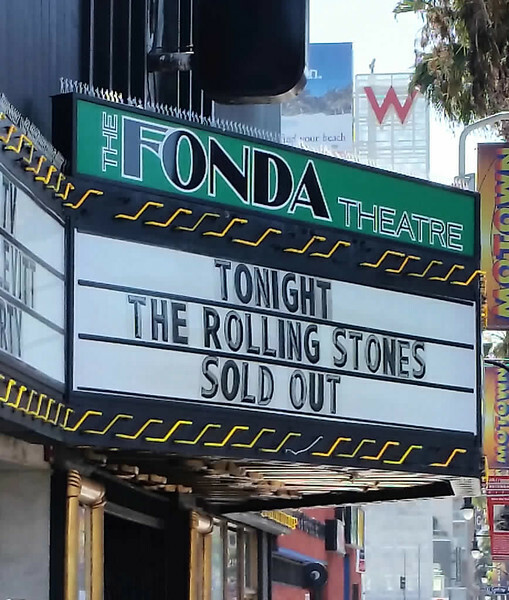 The Lina Lecaro review in the LA Weekly of the Rolling Stones at the Fonda theater was spot on. So I am not going to attempt to give a comprehensive review of the show. Not that I could, even if I wanted to. Instead I will comment on how the show made me feel, my personal experience, not on what occurred. Firstly, though Lina's review was excellent, the only shortcoming of the show was that my friend Falling James was not as fortunate as I and couldn't get tickets. He and I developed our passion for this music together in our youth. 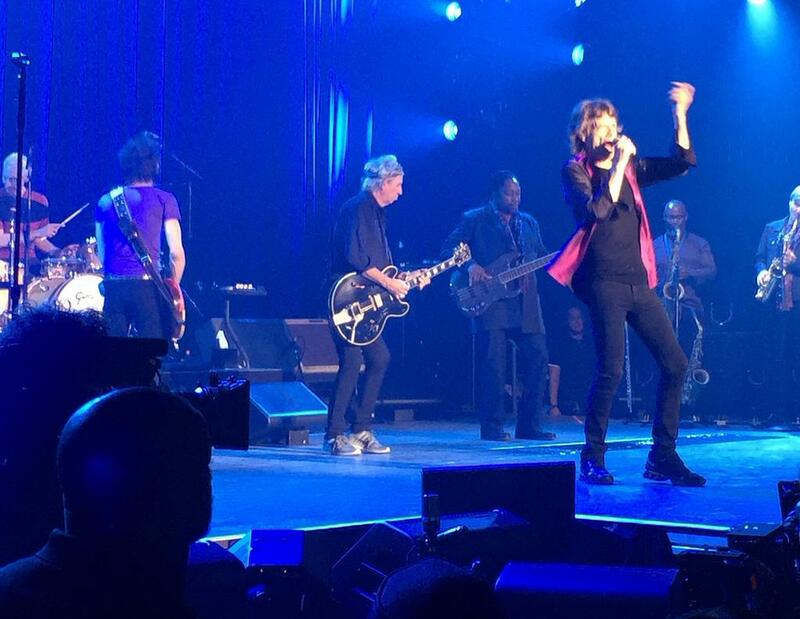 Of the 8 times I have seen the Stones since 1978, 5 were with him. 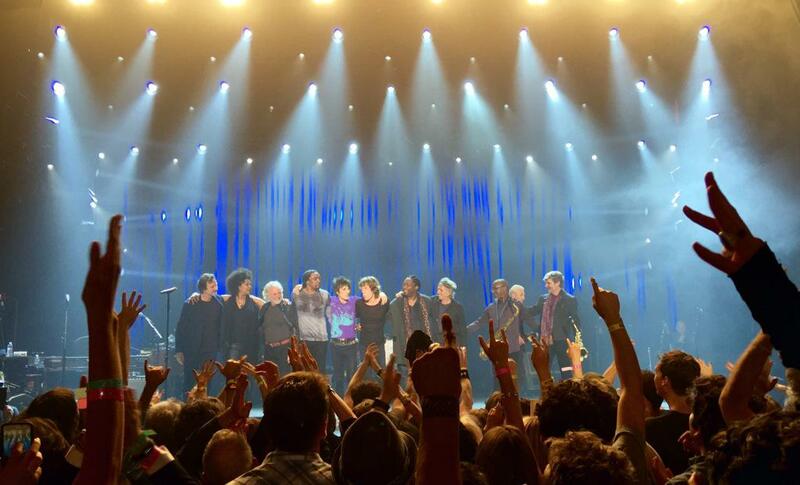 He is a brilliant writer and would have written a spectacular review of this momentous show. We all lost a bit with his absence. So Lina nailed it when she said, "Sticky set made this one of their most special shows ever. Like, ever, ever.". I might have added another ever or two, but I wasn't in Brussels in 1973. Nevertheless, this show was like no other I have seen. 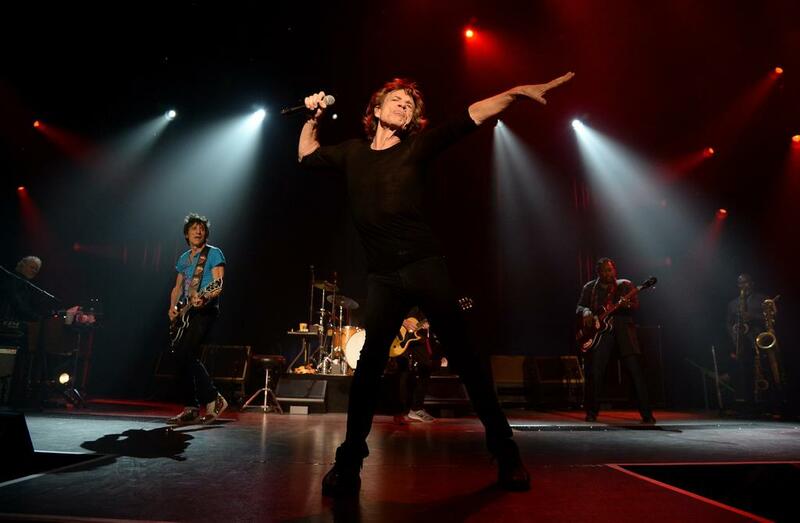 The Stones on a smaller stage provides a visual perspective that allows you to see the entire band without constantly panning your head as you do if you are fortunate to be sitting close to the stage for an arena or stadium show. But what really stood out was that, unlike all the other shows I have seen, every single moment of every single song was absolutely riveting, inducing chills and tears. I have never experienced that at a concert (except perhaps Arthur Lee and Love at the Knitting Factory). Usually Stones concerts are a mix of rockin' tunes and tired war horses. But here, the war horses (Brown Sugar, JJ Flash) and the deep vault stuff - even the covers, were all incredible. The songs that stood out the most for me were, I kid you not, "You Gotta Move" and another deep vaulter that I'll get to in a minute. "You Gotta Move", normally about as engrossing as a funeral dirge, was a foot stomping, soul expanding blues sing-a-long. 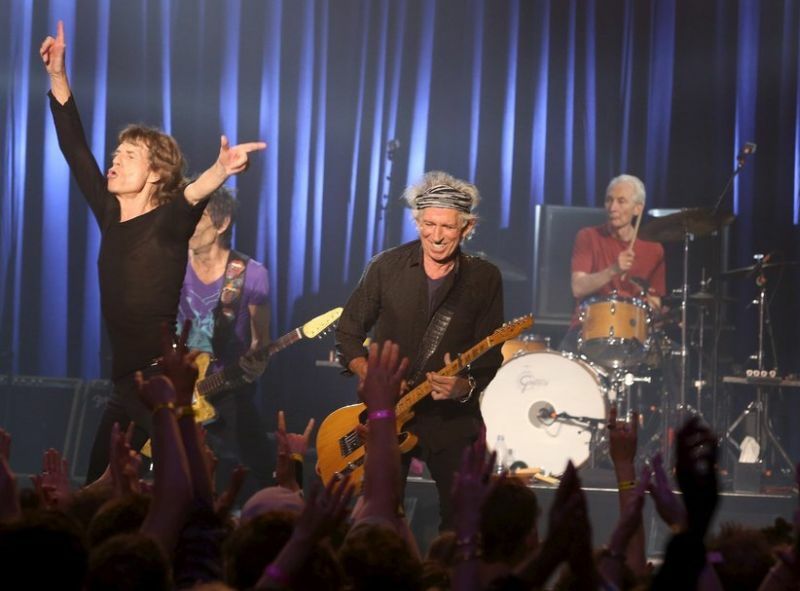 After it was over, Mick asked the audience to sing along with the chorus as if evaluating whether the song would work in the stadium venues to come. Mick looked really pleased and his joy, expressed with that goofy chimpanzee smile, seemed to energize the room. The one song which disappointed me was "Can't you hear me knocking". The second part with the jazzy jam was particularly disappointing. The death of Bobby Keys really hurts this song - much more than Brown Sugar. The replacement did a serviceable job of aping the notes, but it was a dry rendition. Not juicy like Bobby's 2013 sax work at the second Staples show. And Ron Wood, who played spectacularly all night, just doesn't have the right style to do the Mick Taylor part on this song. But the surprise of the evening, was one song in particular that soared beyond all measure. I don't want to imply that the other songs were anything less than their absolute best. But this particular song just transported me into one of those transformational, almost out of body moments that music can sometimes provide. No, it wasn't Moonlight Mile. The highlight of the evening, for me, was Sister Morphine. In Sister Morphine, Jagger summoned the pain in the voice of co-writer and ex-lover Marianne Faithful. He strained a bit to get the notes in the key he chose, but delivered with sublime pathos. Charlie Watts drove the beat in that amazing groove on the rave ups that you hear on the album. It was perfect, one spine tingling rave up after another. And the lead guitar work was better (is it Ry Cooder on the album?) I was spent. Moonlight Mile was good but not particularly memorable. I suppose I had the highest expectations for this song and it didn't quite deliver. There was something kind of stilted in the rhythm when the sing "Just another Moonlight Mile". And the arrangement was thin. The war horses Brown Sugar and Jumpin Jack Flash were the best I have ever heard. Brown Sugar finished the set. Usually when this song finishes the set, it goes on and on, too long, and gets tedious. This one went on and on - but it just continued to build. It did not get tedious, rather it became almost orgasmic --- seriously. 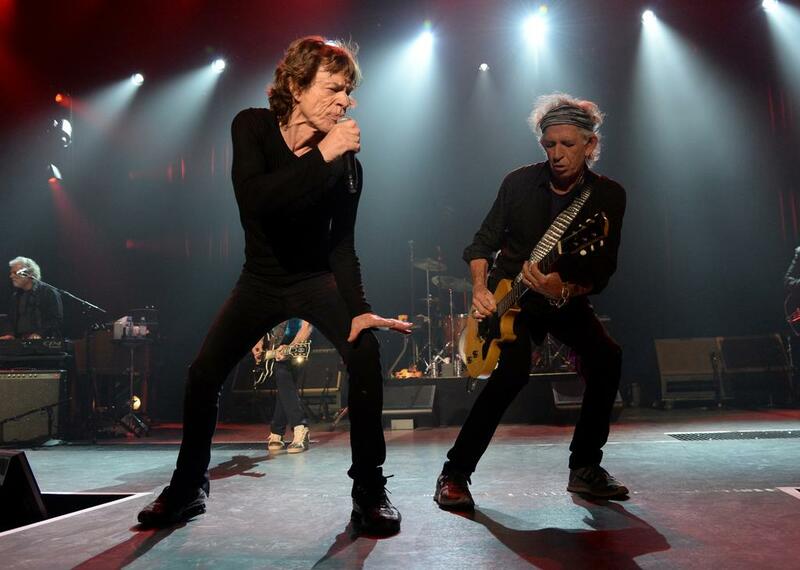 The first encore, Rock Me Baby, brought the Stones back to 1962, especially given the venue. Just a great blues band. Mick with his blues harp and Keith and Ronnie snarling away. 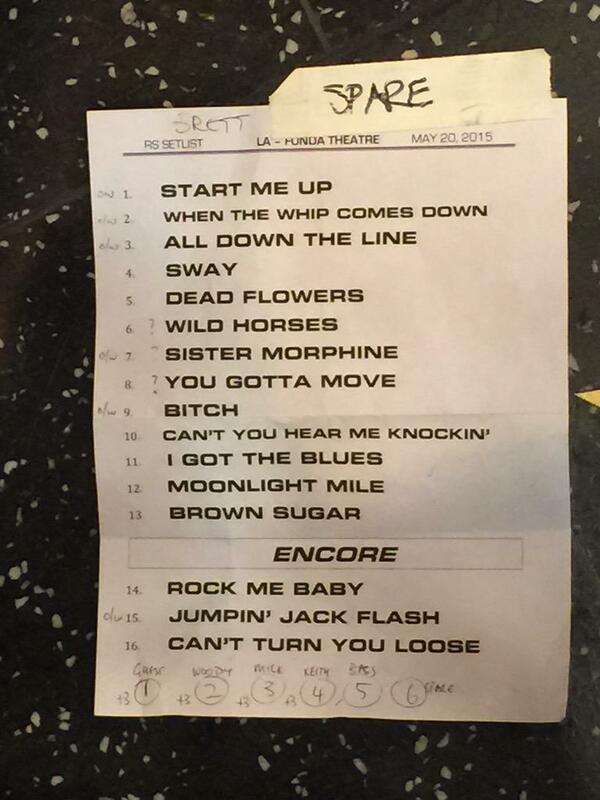 Speaking of snarling the 2nd encore Jumpin Jack Flash, was incinerating. 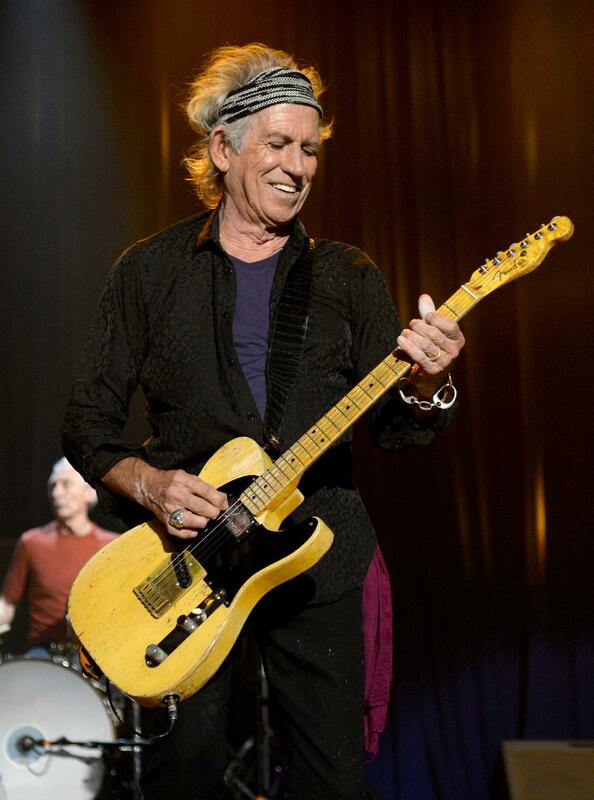 Keith pounding on his famous butterscotch Telecaster "Micawber" which snarled out the "force of nature" that are the chords of Jumpin Jack Flash. The sound/mix was perfect. Not much more can be said except best ever. I have been really fortunate to see the greatest rock n roll band in the world twice from close vantage points -- both times with my daughter Allison. These shows count among the greatest moments of my life. I know, it's only rock 'n roll..but I really like it. I simply can't write about this show without getting emotional. "Sticky Fingers" was my first Stones album... Somebody else would have to write the "reporter" version of the show. I was totally into Stonesland for this show. This is written as I just came back from the Fonda show at midnight. I could not sleep until 3am. 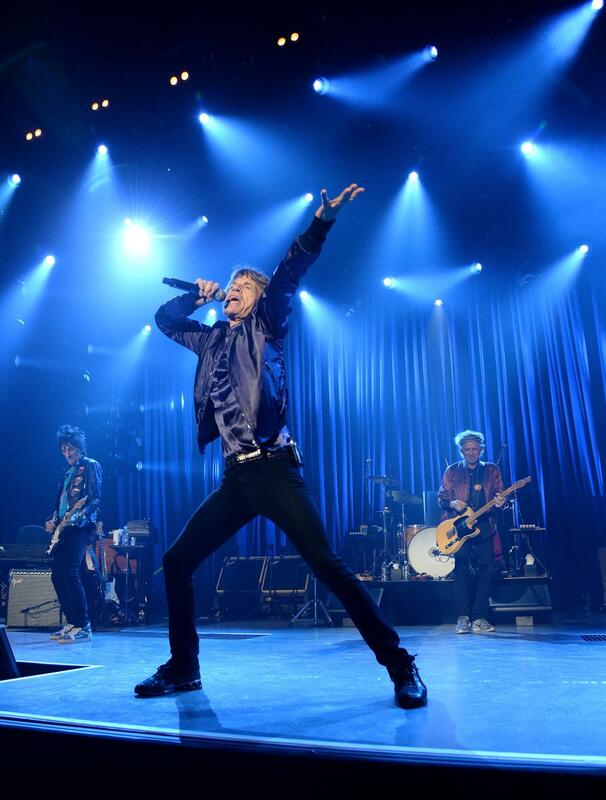 People ask me this: What is the best ever show you have seen with the Stones? I mean I have seen them many times, but still, my answer is always the same: You can't compare shows. Like I can't compare my children. They are all unique. Sure there has been some outstanding shows. My best memories are from Roseland, Brixton, Wichita, and a number of great shows in Hartford, MSG and Buenos Aires. But still... As of today, it is all clear. 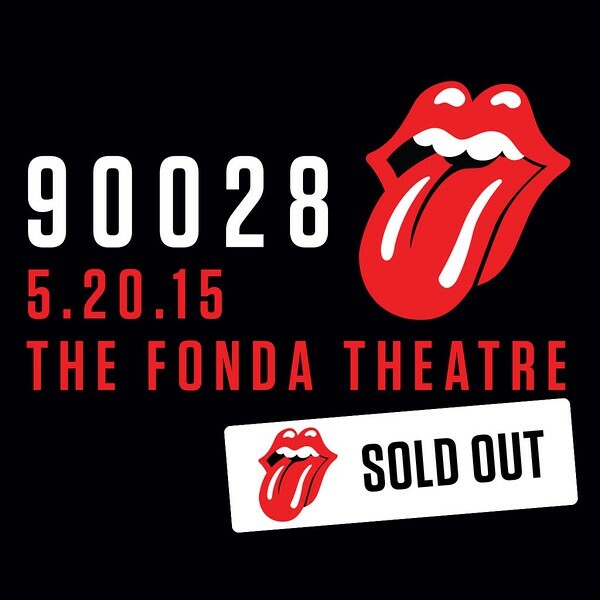 My best Rolling Stones show ever so far was at the Fonda Theatre in Los Angeles California Wednesday May 20, 2015. They started off with "Start Me Up", like a regular show. Except Keith came walking on stage, Pierre strapped his guitar, the rest of the band arrived, and we got "Start Me Up". I was in the front, with friends to my left, and with half a dozen great looking girls in their 20's on my right. As some of them left before show start, I was up there in the front from the start. I was never more than 5-10 meters i.e. 15-30 feet away from Ronnie, Keith and Mick tonight, during the show. Charlie was close too, as the rest of the band. I use glasses at shows these days, but not tonight. I could not get any closer. They did "Whip" and "All Down The Line". Both great songs. We were some 700 people in the crowd including the 100 or so in the celebrity balcony, but I hardly turned my back to the crowd. My only worry was the fact that this should have been available to more fans but then it would not work the way it worked tonight. Jack Nicholson was there, Little Steven was there, this was Hollywood, a bunch of celebrities would be expected. Then it is time for STICKY FINGERS. The whole album. Live. This was my first Stones album. The reason why I am here, why I am following the Stones, why IORR does exist. 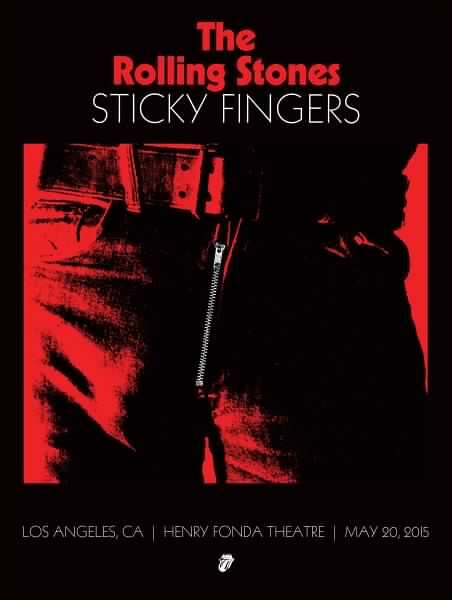 I got "Sticky Fingers" in August 1971, and from that day I was hooked, Sticky Fingers and The Rolling Stones defined a large part of my life as from that date. SWAY was so great. And it was so great they started with my favorite song of the album! Dead Flowers was another favorite. I just loved it. The emotions came on "Wild Horses". I don't know why, I have got "Wild Horses" so many times live, but the way they did it, the small room, and the memories from my teenager days back in 1971, as a kid age 16 playing "Sticky Fingers" to the pieces, at my parents home, my first home, I got tears in my eyes, it was such a great version of "Wild Horses". The camera man was always on our faces, I just hope he did not catch me in those moments. But I loved every bit of it. I am not going to do a song by song here, I made nok notes, don't remember all the details. But I do remember Keith's white teeth! When his band members were shining, Keith was all smiles, and that is the best part of the show, when you enjoy it so much, and you see Keith do the same. Big smiles. Mick bumping into Ronnie. Mick facing Charlie playing the guitar. 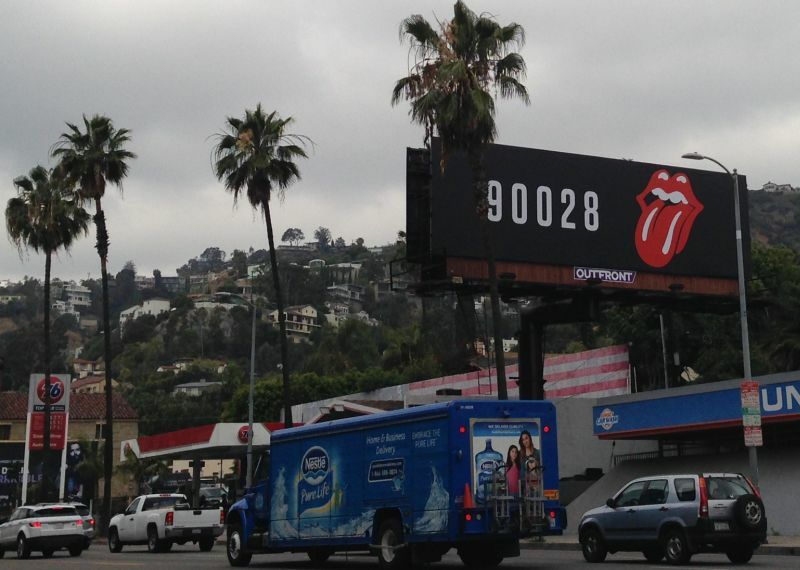 Mick and Keith getting close. Guitars, guitars, and Charlie doing his minimalistic drumming. Matt Clifford was there next to Chuck Leavelle on many songs. It gave them a wider sound and it worked well. Karl Denson made his own touch for solo on "Can't You Hear Me Knocking", I was frozen watching and listening to his unique rendering of the Bobby Keys spot on this song. Mick did mention it almost had a jazz touch. Sure it did. The question is if the fans want it identical, or if they are ready for a different touch. I loved it anyway. Chuck Leavelle did a great solo on "I Got The Blues". At this point of the show, I was still in my teenager room with my record player, listening to Sticky Fingers, and it just happened that the band who made this album was right in front of me, on stage, performing the very same album live right now. Moonlight Mile. Again I got emotional. Half a year after I got Sticky Fingers I met my wife, still my wife now, she gave me the freedom to follow the Stones during all these 44 years, still counting, and I felt she was right here in this room. The musical rendering of the song was absolutely amazing, I wish they could do it more often. As they closed the Sticky Fingers session with "Brown Sugar", my time machine trip back to my teenager days of 1971 ended quickly. Yeah Year Yeah, hands up, my mind was back in the stadium show mode, thinking about the next show in San Diego... Thanks for bringing me back 44 years during the 53 minutes the Sticky Fingers session lasted! The rest you may read about on Internet. "Can't Turn You Loose" must be kept on the tour, for every show. It is a crowd pleaser, and I hope they will do it 15 times more on this tour! Are they hot? Yes! Are they on? Yes! Are you going to San Diego? No? Get sorted! Get down there, it will be a memory for lifetime. See you in San Diego on the real tour start Sunday May 24!